Outreach Activities will focus on the external ministries of ELC and will focus in two areas: 1) Local Outreach and 2) National/International Outreach. Local Outreach focuses on local community programs or ministries, such as ,but not limited to, the current six (6) ministry groups of: a) Cooperative Emergency Outreach (Brews for Blessings); b) Head Start; c) The Outback (Chari-o-ke), such as Snack Packs & Happy Hollow; d) Peace at Home; e) Seven Hills Homeless Center; and f) Quilted Devotions. The co-chairs are Beth A. and Linda E. Please contact either of them if you want to help or to get more information. You may also contact the Church Office (479-442-3040) for information. National/International Outreach focuses on special programs or ministries with national or international appeal. Currently, the national/international focus is on the Bathania Kids of India and in assisting the NALC with there programs and funding. Other national/International programs will be forthcoming. The chair is Kraig O. Please contact him if you want to help or to get more information. You may also contact the Church Office (479-442-3040) for information. The Outreach Committee will have a “Contingency/Emergency Fund” as part of their budget each year. This Contingency/Emergency Fund will be utilized at the discretion of the Committee for urgent or emergency needs identified by one of the six ministry subcommittees being supported or for any other need identified by a member of the congregation which is brought to the Committee for consideration. and approval. The Outreach Committee will only review requests affecting organizations and not individuals. ELC does not have the infrastructure to support requests from individuals for personal assistance requests. A February, 2017 Survey of Homeless in NW Arkansas reported that the homeless population increased to 3,000, as compared to 2,462 in 2014. The 2017 survey also reported that 51% of the homeless population was children. Open letter from 7Hills detailing the Homeless population in NW Arkansas and there most pressing needs. Thank you for your ongoing support of 7hills Homeless Center. I wanted to update you on the need in our community and what 7hills is doing, with your help, to meet the need. The “point in time” survey, conducted by the University of Arkansas every two years, provides a count of homeless individuals in Northwest Arkansas. In 2007, the survey counted 1,170 individuals experiencing homelessness. The most recent survey, in 2014, counted 2,462 individuals. This means that while NWA’s general population has grown 5 since 2007, the homeless population has grown a staggering 112. The bottom line is that homelessness is a large and growing problem for more and more of our neighbors. 7hills’ mission is to fight homelessness and poverty with education, opportunity, and hope. We operate a day center program, a transitional living apartment community, and a veteran-focused community based housing program. Our housing programs provide an opportunity to transition people out of homelessness and we’re very proud of their success. But I’d like to focus on the services of our Day Center to show you the impact your support has in this program. 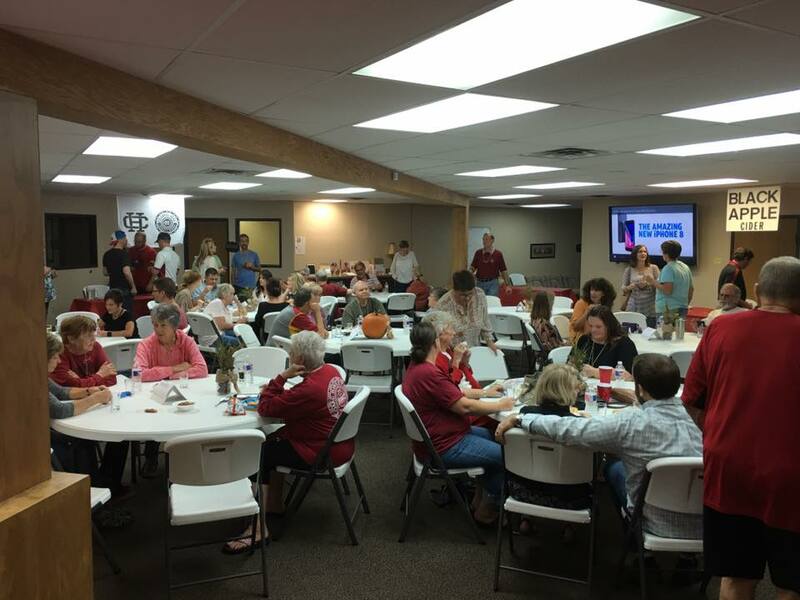 The 7hills day center serves approximately 500 people in any given month. We serve over 1,800 meals, pass out around 400 food bags, distribute over 1,500 items of clothing, and provide over 800 showers. This happens each month! We provide state ID and birth certificate assistance to clients trying to make a new start. Through our community partners we are able to offer free physical and mental health care (50+ people/month), employment support (25+ people/month), and legal assistance (15+ people/month) … and the list goes on. We support our clients in these ways because of your continued support. Cooperative Emergency Outreach provides emergency assistance to residents of Washington County, AR, living in Fayetteville, Cane Hill, Elkins, Farmington, Greenland, Goshen, Lincoln, Prairie Grove, Summers, West Fork, and Winslow. MONTHLY DONATIONS: There is a separate offering basket labeled CEO donations on the information table. 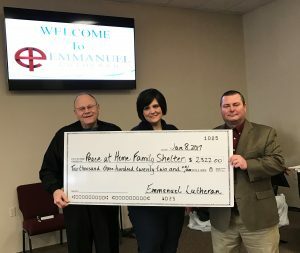 Please bring loose change or checks made out to Emmanuel Lutheran Church for CEO on the last Sunday of each month, which is designated as “CEO Sunday”. The offering put in this basket will be designated as a gift from ELC as a member church. If you are unable to attend a CEO Sunday, you can drop your donation in the basket at any time. To read the latest CEO News, Go Here!!! To learn more about CEO, Go Here!!! 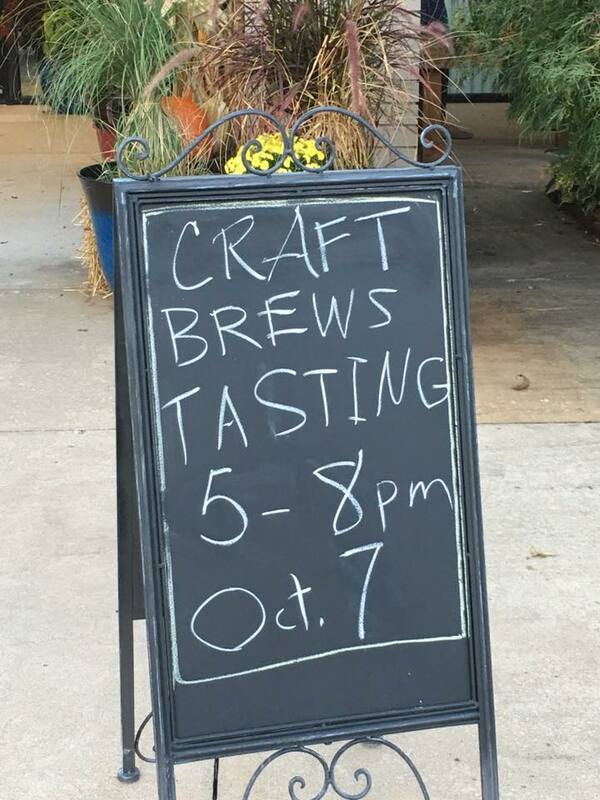 ELC conducts an Annual Brews for Blessing Fundraiser in support of CEO. 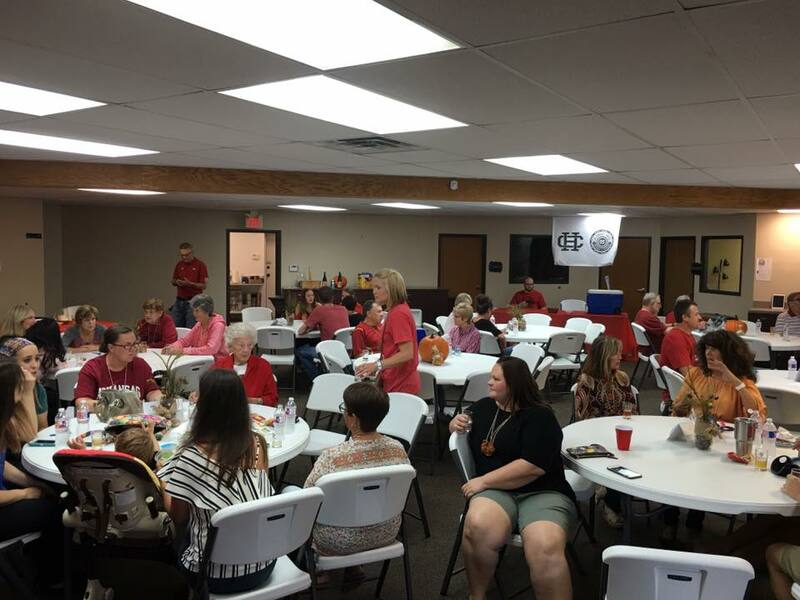 ELC conducted its Third Annual Annual Brews for Blessing Fundraiser in support of CEO. 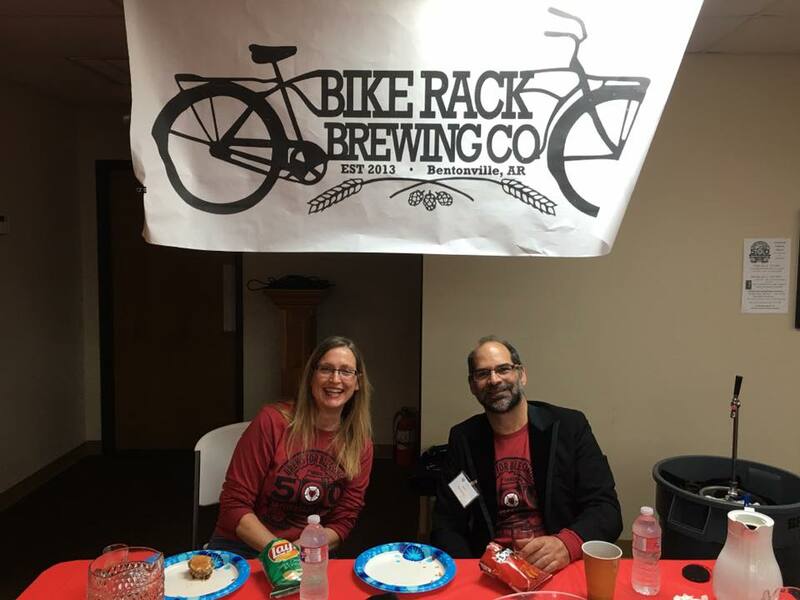 The 2017 Brews For Blessing Fundraiser was held on October 6 & 7th and raised $7,000 for CEO. 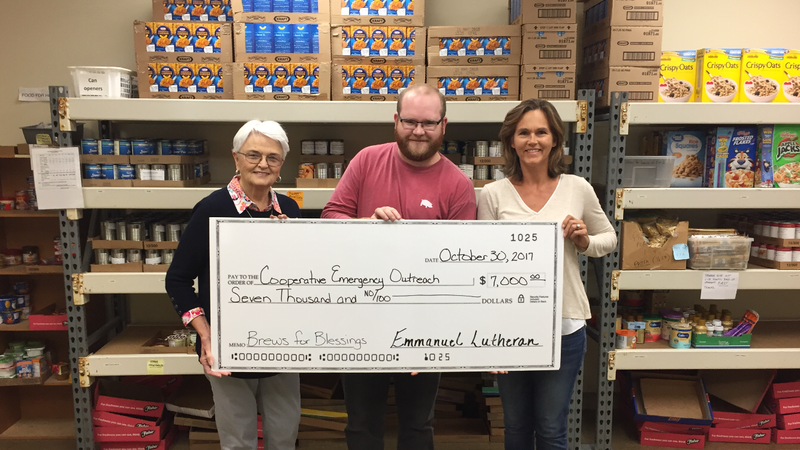 Pictured in the presentation are (L-R): Linda E., Vice-President of CEO Board and a member of Emmanuel; Bart S. members of the Brews For Blessing Team and members of Emmanuel; and Beth Armstrong, Secretary of CEO Board and a member of Emmanuel. 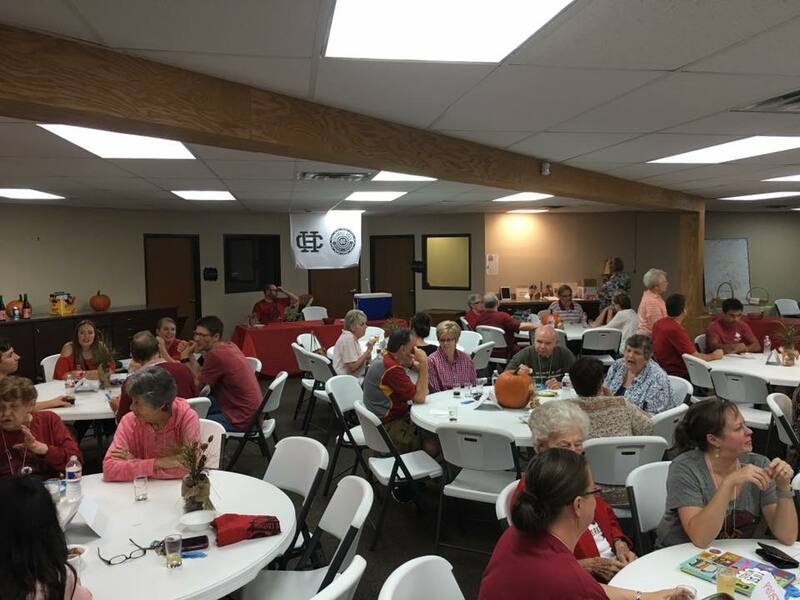 The second annual, 2016, Brews For Blessing Fundraiser was held on October 1, 2016. 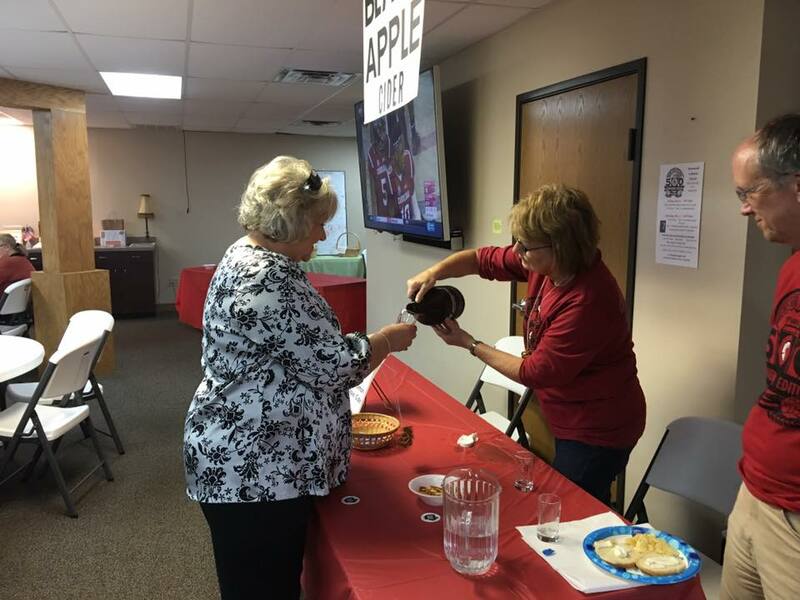 It was also very successful and raised over $5,100 for CEO. 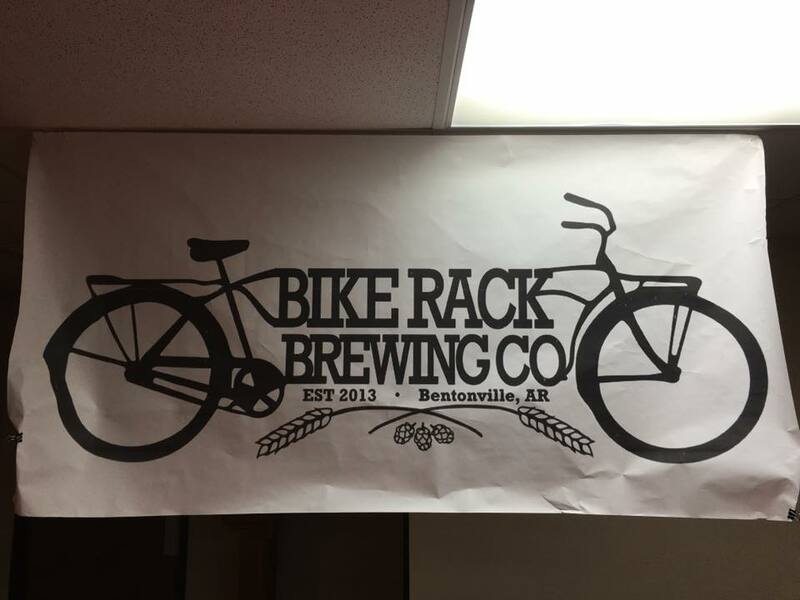 In 2015, our first Brews for Blessing fund raiser, raised over $2,500 in support of this effort. View a slide show of 2017 Activities below. 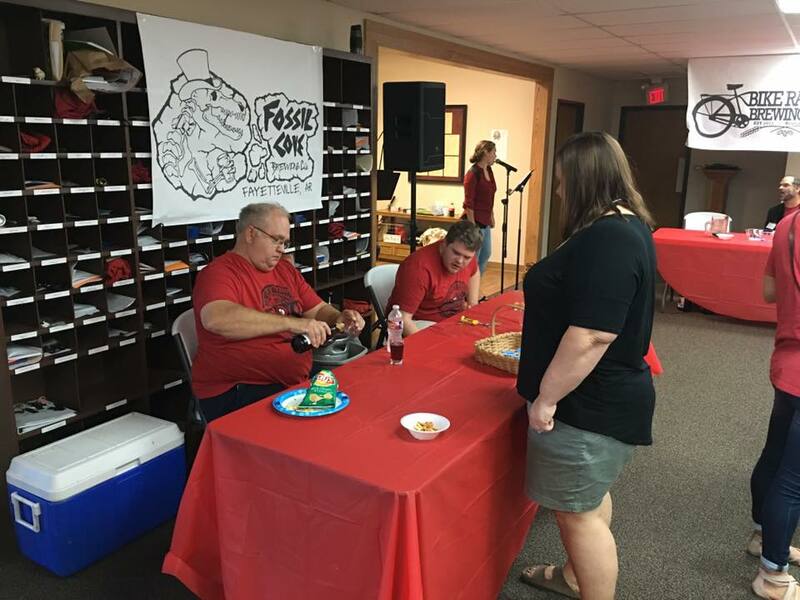 The Local Outreach Committee provides assistance through the Fayetteville Public Schools “Outback” Program by focusing on their Food Pantry and Happy Hollow Elementary School. FOOD PANTRY is for students enrolled and attending Fayetteville Public Schools. The Outback focuses on the needs of all families in transition within the school system. This includes children who are utilizing the free and reduced lunch program as well as homeless families in the district. More than 40% of the students are enrolled in the free and reduced lunch program and there were 262 homeless children in the district as of early May, 2016. 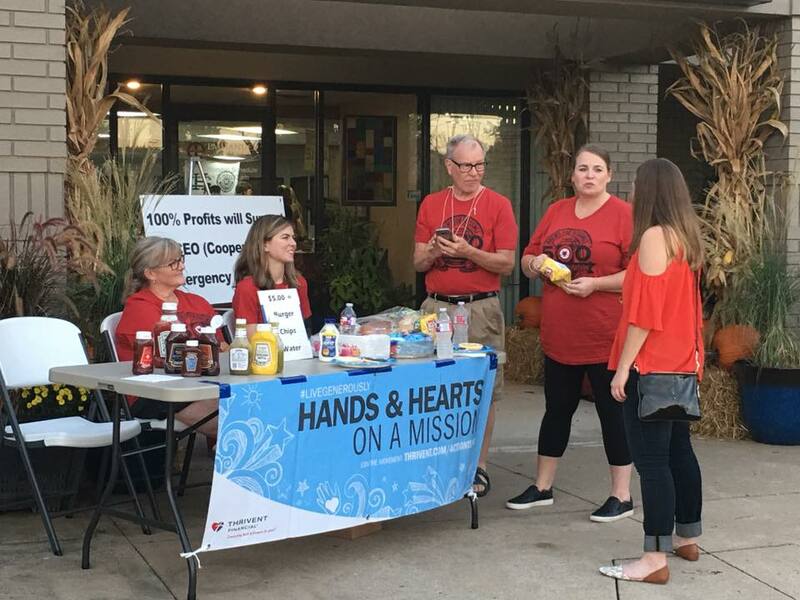 The Outback provides food and clothing (with the help of Potter’s House) on a regular basis and makes sure that children have a “snack backpack” each weekend so they don’t go to bed hungry. 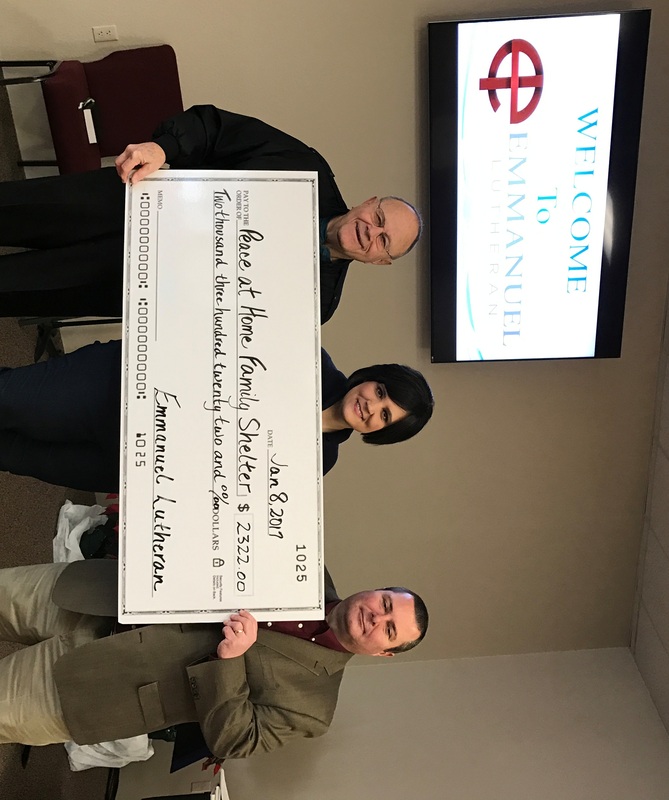 Since August of 2015, Emmanuel Lutheran Church members have been picking up the snack packs and delivering them to the schools that distribute them to these needy children. We deliver over 650 snack packs each week. If you would like to help deliver, please email Beth Armstrong at beth@ah-ins.com. In addition to the snack pack delivery, Emmanuel Lutheran has provided Thanksgiving meals, food for these families while the children are home on holiday breaks, and our Christmas clothing drive provided coats, shoes and jeans for the families identified by the Outback. Check out The Outback Facebook page for a list of their needs and where to deliver them. THANKSGIVING BASKETS: Cargill continues to generously donate 30 turkeys for The Outback families Thanksgiving meal! Others are asked that, while they are shopping for THEIR OWN Thanksgiving feast, they might pick up a few extra items: pumpkin, stuffing, sweet potatoes, cranberry sauce, etc. for the Outback effort. 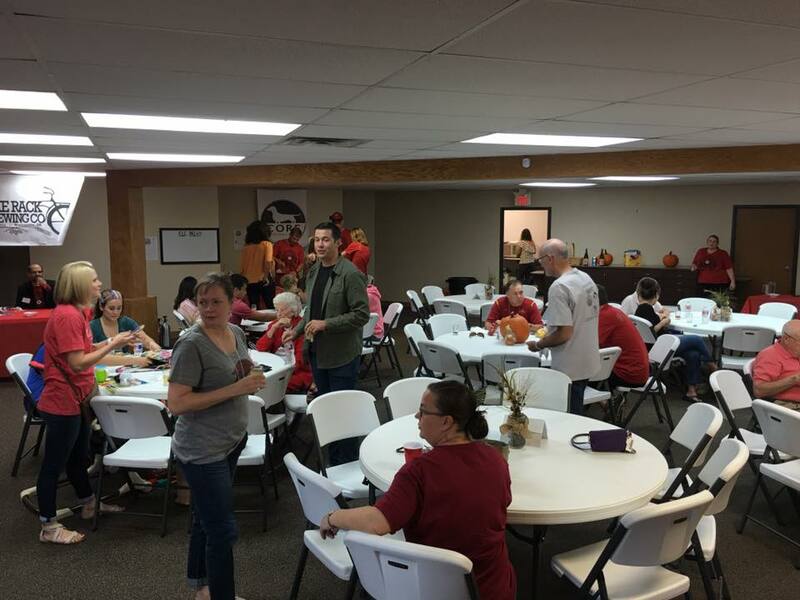 In addition to the donated items by ELC members, the Fellowship Committee will be purchasing perishable items and putting the baskets together after the late service before Thanksgiving. Everyone is encouraged to stay and help pack the baskets. LUNCH BUDDIES – having lunch with a student(s) who could use a relationship connection or a little extra attention. Sometimes a student needs a good role model. READ WITH A STUDENT – reading to a student or listening to a student read. If you are interested in one or both of these opportunities – please sign up. We will connect you with a student. BOX TOPS FOR EDUCATION – please continue to save boxtops – collection box is located on bookshelf by the front door. More information on Outback, such as a description, an overview and the mission of this program, may be found on the Outback Facebook Page. The Peace at Home Family Shelter (PAH) was the first emergency shelter for domestic violence victims in Arkansas. In 1976, community leaders began meeting to develop services for battered women. A crisis hotline was soon established and by 1979 emergency shelter services began. Since inception, the PAH mission has focused on ending family violence by empowering victims to survive and thrive by nurturing their self-determination and courage; and to promote healthy relationships and compassionate communities through education, outreach, and advocacy. 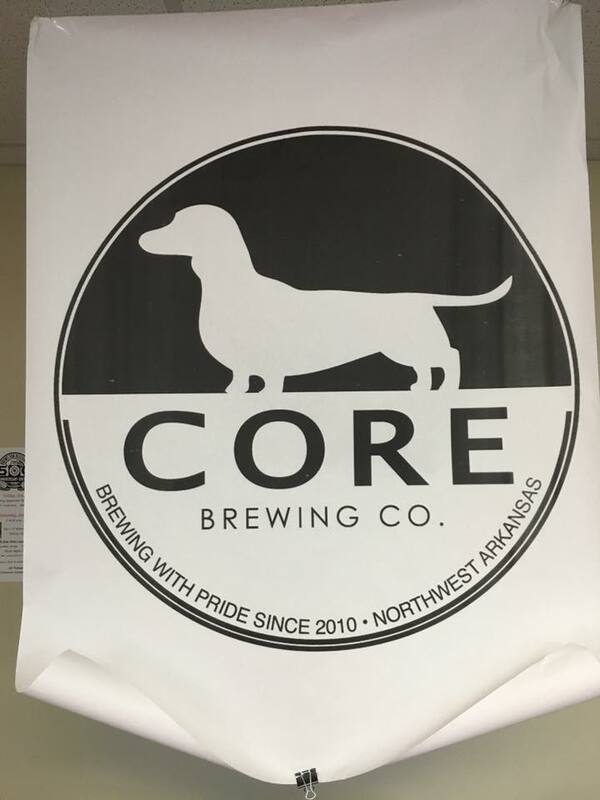 They believe PAH of Northwest Arkansas can be a national model where every person who seeks freedom from violence has the support needed to obtain and maintain violence-free homes and heal from the devastating effects of violence. PAH provides a comprehensive program designed to empower victims, educate the community about violence, and address the systematic processes that encourage violence against women and girls. PAH operates a 24/7 crisis hotline available to those in immediate danger. Victims may call the Center at any time at 877.442.9811. PAH provides emergency shelter which houses hundreds of families annually and provides supportive services including free legal services, immigration assistance, national human trafficking partnerships, transitional housing, and mental health intervention. PAH acts as an ally to survivors and engages in nationwide advocacy to bring the issue of domestic violence forward as a priority. During the 3rd quarter of 2016 PAH housed 22 families including 33 children at the Shelter. In addition, they provide supportive services for those not presently housed at the Shelter. These supportive services are being provided to 402 families, including 510 children. In addition, they are expanding their facilities. The expansion will add 4 large family rooms with their own bathrooms to our facility. This will allow them to shelter up to 20 additional women and children at one time, depending on the number of children in a family. In support of this need, ELC will be conducted a fundraiser from October 16 through November 13, 2016 to facilitate the Shelter’s purchase of high priority items. 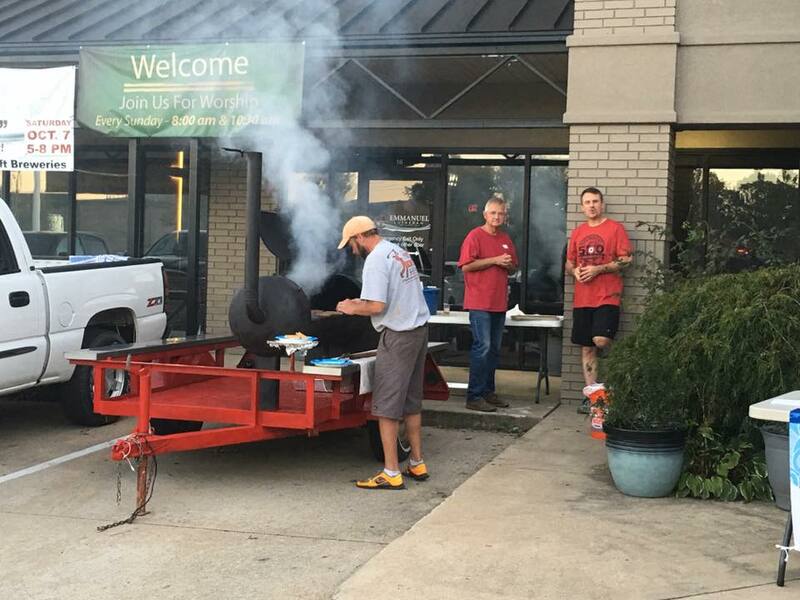 We raised $2,322 for the shelter of which $500 came from the Washington-Madison County Chapter of Thrivent Financial. As an example, the Shelter’s needs include: but is not limited to: twin (38) and full (10) size bedding (sheets, pillows, blankets); small Walmart gift cards-$10, $15, or $20 (for gas, emergency prescriptions); and size 4, 5, or 6 diapers. Since the specific needs changes from week to week, it is important to allow the Shelter the freedom to purchase the needed item on an “as needed” basis. Hence, the rationale for a fundraiser. Have any interest in quilting? 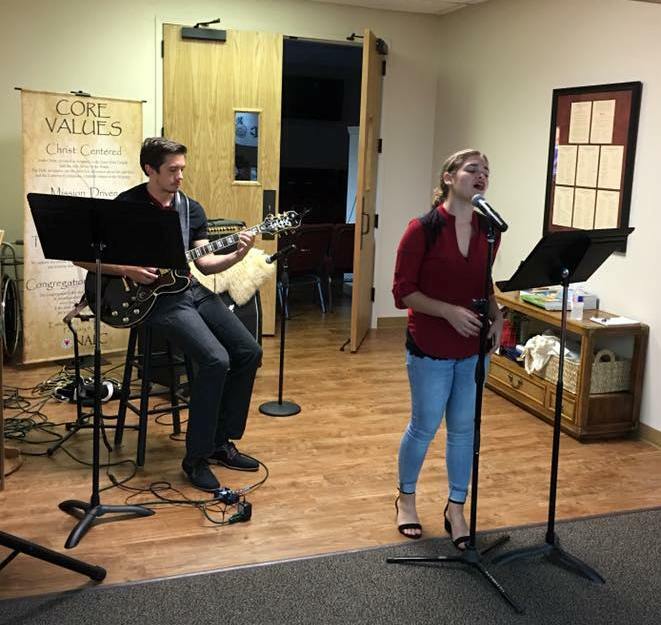 The Group meets ON TUESDAYS OF EACH MONTH from 9am-lpm in the Fellowship Hall. Come and join us. We have several quilts in the process of being completed in order to fill the needs for this year. Currently, quilts are on display in the Fellowship Hall. We have made a commitment to make 20 baby quilts for the new Children’s Hospital. The group encourages anyone with interest, including those who want to learn, to join them. Any questions? Please contact Lori Jones or Jill Steingraber. 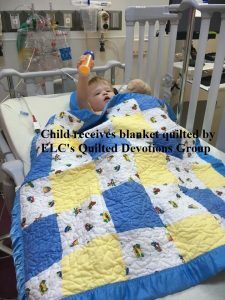 Anyone may help this ministry by donating quilting items : All types of fabric, yarn, thread, lightweight blankets, colored sheets, baby blanket binding, etc. — 15 quilts that were presented by Marilyn Hoke to the Youth Bridge boys as they completed their program. — About midyear we made another 5 quilts and donated them to the girls at Compassion House (a home for pregnant girls under 18). As outlined earlier, the current focus is on the Bathania Kids of India and in assisting the NALC with their programs and funding. 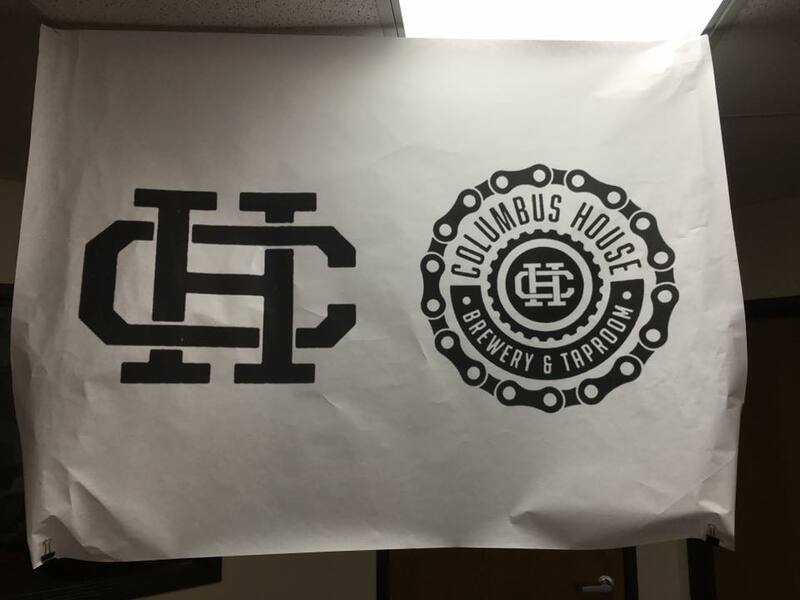 In the budgeting process, 5% of the total revenues has been dedicated to support this effort. In 2016, ELC committed $20,000 as a challenge grant to the NALC Seminary program. As this area of Outreach matures and funding for this effort increases, it is expected that the national/international programs will significantly expand. If a congregational member has suggestions for a program in this area, they are asked to submit a request to the National/International Outreach Committee Chair, Kraig O.